I know many, many parents who swear by this book, especially for “getting to know” baby's needs in the first few months after birth. The book even has an average review of 4.5 stars from 770 people on Amazon! 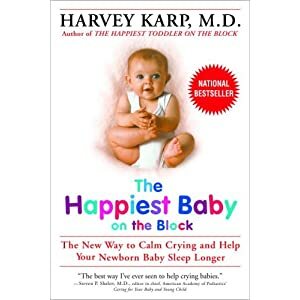 Right now you can pick up The Happiest Baby on the Block by Dr. Harvey Karp on Amazon for just $7.49. That's 50% off the list price! If you're an Amazon Mom with your free trail of Amazon Prime, you'll even get 2-day shipping. Otherwise, shipping is free when you spend $25 or more. Personally, I found the simple, nurturing methods in the book to just make sense, and James and I put a lot of them into practice after Haiden was born. Add me to the list of people who recommend this book!